It is commonly argued that learner participation and interaction can be enhanced by the use of Personal Learning Environments (PLEs). However, this idea has yet to be reflected in practice. In this sense, researchers are encouraged to do more empirical research in order to know whether PLEs could allow the transference of the participative and networked nature of Web 2.0 to the institutional sphere. In this sense, this paper presents a differential study in which the authors analyzed student participation and interaction when working with a Virtual Learning Environment (VLE) and a PLE in two online, higher education courses. With that aim in mind, participation measures were calculated and social network analysis was performed on the digital data collected from the learning environments. The findings reflect the effectiveness of a PLE over a VLE for facilitating student participation and for assisting students in the creation of more cohesive learning networks. Virtual Learning Environments (VLEs) have become the cornerstone for deploying eLearning platforms in higher education (Browne, Jenkins, & Walker, 2006). Although VLEs have some advantages, such as a high level of control by educational practitioners, managers and policymakers, they also have some disadvantages due to the asymmetry in the relations between the students and the institutions that use this type of platforms. Besides, taking the subject as the only organizing axis limits learning to the academic sphere, leaving aside life-long learning, where there is an important role for cross-organizational learning, and for non-formal and informal learning. In this sense, learning management performed through a VLE makes difficult to link personal and institutional spheres of a learner; does not cover all the curricular, productive and communicative needs that different learners require in distributed and complex learning contexts; and lacks of a gateway back to access learning evidences and social capital (Casquero, Portillo, Ovelar, Benito, & Romo, 2010; Casquero, Ovelar, Romo, Benito, & Alberdi, 2013; Casquero, Ovelar, Romo, & Benito, in press). 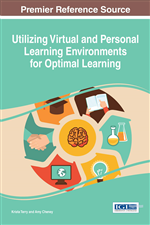 In summary, VLEs leave little room for students to personalize and manage their own learning spaces (van Harmelen, 2006; Väljataga, Pata, & Tammets, 2011). Current trends indicate that Web 2.0 and social media have the potential to change the delivery structures, interaction options and pedagogical perspectives in the field of online learning, with student interaction at the core of learner-centered learning environments (Beldarrain, 2006; Franklin & van Harmelen, 2007; Klamma et al., 2007; Alexander, 2008; Ravenscroft, 2009). It finally appears that the user-centered, networked and distributed nature of these technologies aligns with the learner-centered, collaborative and ubiquitous approaches being advocated by current pedagogy (Conole, Oliver, Falconer, Littlejohn, & Harvey, 2007; Pallof & Pratt, 2007; Bower, Hedberg, & Kuswara, 2010). As a result, there is a growing body of research in educational literature that expresses positive perceptions about the impact of Web 2.0 and social media in formal educational settings (Hemmi, Bayne, & Land, 2009; Meyer, 2010; Hrastinski & Dennen, 2012). The tendency to import Web 2.0 technologies and patterns continues to increase in higher education, making institutional distribution and communication systems more open to the integration with third party services (Boston, 2009; Santos & Pedro, 2009; White & Davis, 2011). However, there is a need for educators and institutions “to be wary of simply importing Web 2.0 technologies and patterns into classrooms on the presumption of transforming education” (Selwyn, 2007, p. 7). Learner’s acceptance of Web 2.0 technologies and patterns, generally used for non-educational purposes, might not necessarily imply acceptance for learning purposes (Cole, 2008, as cited in Karasavvidis, 2010).